BADIL does not include any financial data, donor information, or sources of funding on its website, reflecting a complete lack of transparency and accountability. According to information released by donors, BADIL received a core funding grant of $540,000 (2014-2017) from the Human Rights and International Humanitarian Law Secretariat (joint funding from Sweden, Switzerland, Denmark, and the Netherlands). BADIL has also received funding from DanChurchAid (Denmark) (300,000 Danish Kroner in 2016) and Trócaire (Ireland). BADIL submits written and oral statements and hosts numerous side events in condemnation of Israel before the UN Human Rights Council. The conference featured Eitan Bronstein Aparicio (founder of Zochrot), Jamal Juma (Stop the Wall), Mona El Farra (Middle East Children’s Alliance), Omar Barghouti, Sahar Francis (Addameer), and Ali Abunimah (Electronic Intifada). 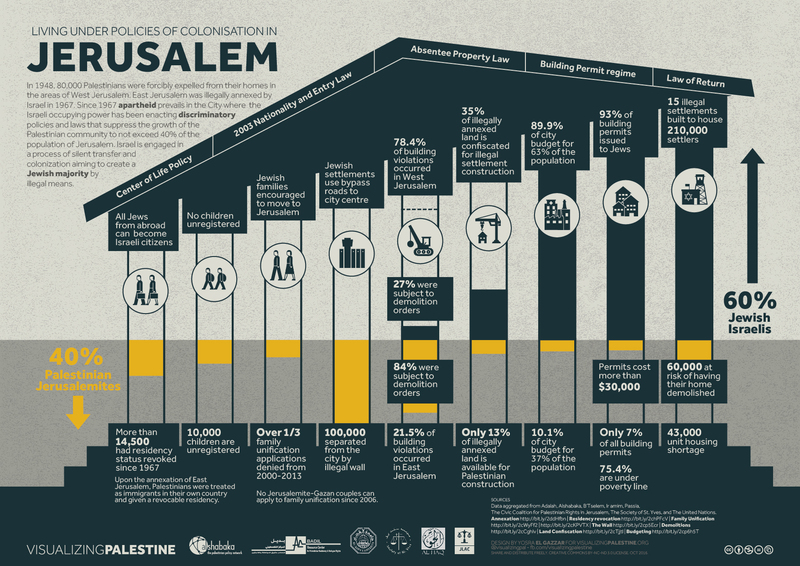 In January 2017, BADIL, alongside Al-Haq, Society of St. Yves, Al-Shabaka, and Jerusalem Legal Aid & Human Rights Center (JLAC), released an infographic aimed at “raising awareness of Israel’s apartheid policies in the city, its effects on the Palestinian population, and the gross violations of international humanitarian and human rights law that arise.” The infographic claims that “Since 1967, apartheid prevails” and that Israel has “been enacting discriminatory policies” in Jerusalem. In December 2016, BADIL released a working paper titled “Forced Population Transfer: The Case of Palestine- Suppression of Resistance,“ discussing how in its “suppression of resistance, Israel has not only made use of excessive force to stop armed struggle but it goes as far as to criminalize and suppress demonstrations or even the development and practice of Palestinian culture,” as well as stating that “throwing stones has been the symbol of Palestinian resistance for decades” (emphasis added). In March 2016, BADIL partnered with Zochrot for “The Third International Conference on the Return of Palestinian Refugees,” and gave a lecture titled “Practical Return in Palestinian Civil Society: Challenges and Opportunities.” Other lectures included “From Banning the Nakba to Bridging Narrative: Law and Collective Memory of 1948” and “Cracks in Zionism? The Implications of Return for Zionist Ideology and Practice.” The conference was funded by the American Friends Service Committee (AFSC), a US-based Quaker organization that leads anti-Israel BDS campaigns on college campuses and in churches. In 2012, Zochrot and BADIL published a manifesto that encouraged a “de-zionized” one-state solution, essentially calling for Israel to be dismantled. 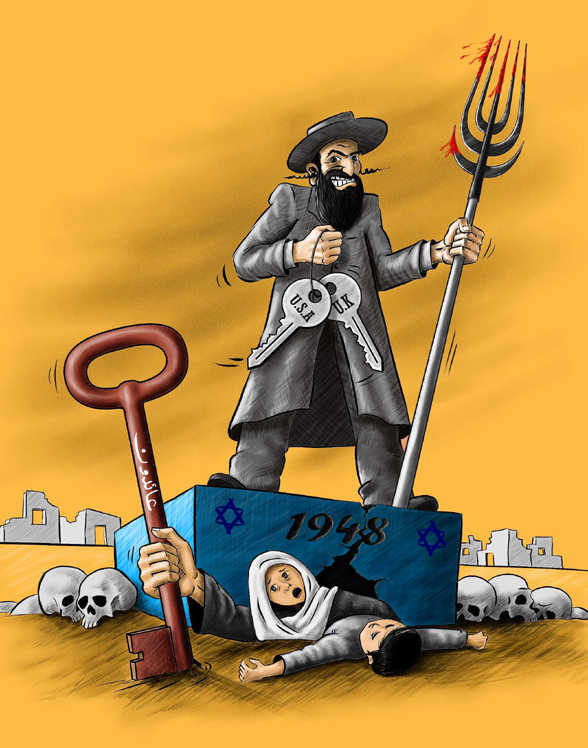 An antisemitic cartoon won a monetary award for 2nd prize in BADIL’s 2010 Al-Awda Nakba caricature competition. The cartoon is a blatant representation of classic antisemitic tropes, including a Jewish man, garbed in traditional Hasidic attire, with a hooked nose and side locks. He stands above a dead child and skulls, holding a pitchfork dripping with blood. The antisemitic caricature was removed from BADIL’s website after NGO Monitor approached BADIL partner DanChurchAid on the issue. In 2017, the first prize of BADIL’s Nakba poster contest portrays a man tearing apart the Balfour Declaration. In 2015, BADIL published a cartoon depicting a tsunami of keys rising up and washing over what is supposed to be the “negotiation table” and two people, one of whom is wearing a kippah with a Jewish star on it. Involved in lawfare attempts to prosecute Israeli military officials in international and European courts, and has published in 2009 a report titled “Litigating Palestine,” in which BADIL notes the different venues that can be used to file claims against Israel and the “progress” made in recent years. Advocates for anti-Israel BDS (boycott, divestment and sanction). Partners include DanChurchAid, Middle East Children’s Alliance, Trócaire, Norwegian Peoples Aid, United Methodist Church, Oxfam, and the Mennonite Central Committee (MCC). BADIL holds UN ECOSOC consultative status and is a member of the Palestinian Human Rights Organizations Council (PHROC), Palestinian NGO Network (PNGO), Global Palestinian Refugee Network, Occupied Palestine and Golan Heights Advocacy Initiative, Habitat International Coalition, Child Rights Information Network, International Coordinating Network on Palestine, and the European Coordination of Committees and Associations for Palestine.